It is not often that TRG finds a statement about finance and markets that looks at the industry from a totally new prospective and completely broadens the debate. 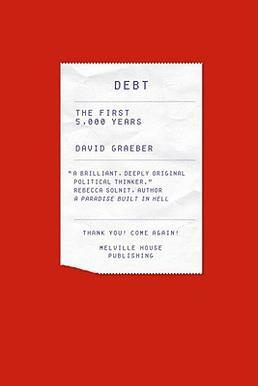 However, the book 'Debt the First 5000 Years' by David Graeber accomplishes that feat in spades, and goes on to completely shake the foundations of Modern Economic Theory. Graeber is a well respected Anthropologist and also a Wobbly, and an Anarchist. Recently, he has been active with the Occupy movement, and has even been credited (by Rolling Stone Magazine) with coining the statement 'We Are the 99%'. TRG loves to have his ideas shaken, and Graeber's background makes him well qualified to accomplish that. TRG has been in contact with other anarchists, and has generally found their arguments weak, poorly thought through, and or Utopian. Graeber's book does NOT make an argument for anarchism directly. What it does is show that the current political debate that pits Government vs Markets is nonsense, and probably counter productive. We need to start asking bigger questions. The book starts with an analysis of the founding principles of Economics. At it's core, Economics has a creation myth, and the book rather effectively attacks this myth. The creation myth of economics is that markets grew naturally as an efficiency improvement over barter based systems. According to Graeber, Anthropologists have long had a major problem with this idea because they have NEVER been able to find evidence of any society that ever existed on anything like the barter system as Adam Smith (and every entry level Economics book) describes it. Graeber lays the arguments out effectively, and although he generally does so in a calm, academic way, don't be fooled. For Economists, attacking Smith this way is a bit like telling the Pope that Jesus was a serial killer! Graeber goes on to debate that our money system is really an abstraction who's existence only works because of an implicit (and sometimes explicit) threat of violence. It is really fascinating stuff! TRG is not totally swayed by all the arguments in the book, and he has not been turned into an anarchist by reading it, but it certainly opens a great debate, and asks the right questions.